It seems like yesterday when we would have to wake up a few hours before sunrise to hit the trailhead and beat the sun and the heat and the afternoon thundershowers. 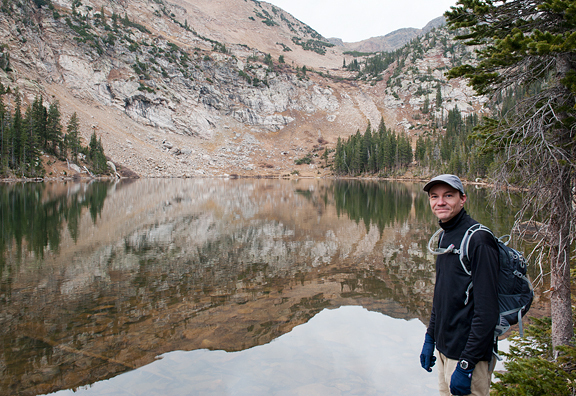 The thing about hiking in autumn, before the snows come, is that we hike any time of day without the typical summer concerns. The bigger issue is running out of daylight if you start too late in the afternoon, or bringing enough layers should temperatures drop or rains fall. 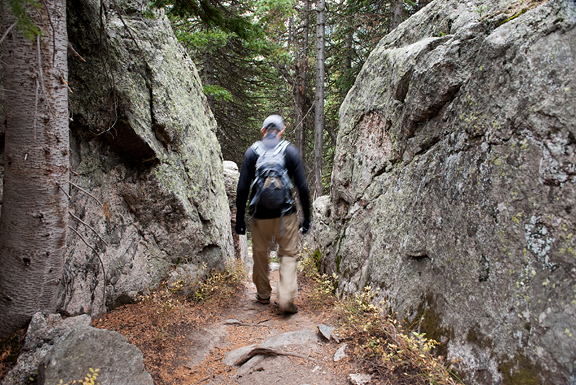 There are fewer people on the trails. The same applies to trail runs where I used to have a short window each morning as I couldn’t tolerate the heat of the day, but now it’s cool enough to run any time. Most of the aspens that were once an impenetrable wall of green or gold now stand bare and reveal views of valleys and mountains in the distance. Soon it will be time to change to flannel sheets. I hold out as long as possible, because I know when it is cold enough for flannel sheets that it becomes a little harder to get out of bed in the morning. We have already begun placing Kaweah’s little flannel quilt over her at night – making a sort of puppy pie as she curls up in her bagel bed, the quilt as the top pie crust. I even say, “Puppy pie!” as I tuck her in and I know she likes it because the tip of her tail wags in anticipation. And speaking of pies, I couldn’t resist the idea of making an apple pie the other day with all of those apples I bought from YA YA Farms. I like pie. I mean, I really like pie, which is why I don’t make a lot of pies. I like them too much. Traditional apple pie is great, but I’m also a lazy bum. If I can get away with making one pie crust instead of two pie crusts, I’ll do it. I have a recipe in a 20-year old notebook that I had jotted down from I don’t know where. Most likely the interwebs, which weren’t web pages back then, but forums like rec.food.cooking or rec.food.recipes – all text-based. Anyone remember those? It was an apple pie… a custard apple pie. I used the Jonathan apples from the farm because they have a nice tartness to them while still maintaining their sugar. For me, sweet on its own is really boring. I like sweet with salty, or tart, or bitter, or spicy. It’s just more interesting that way. 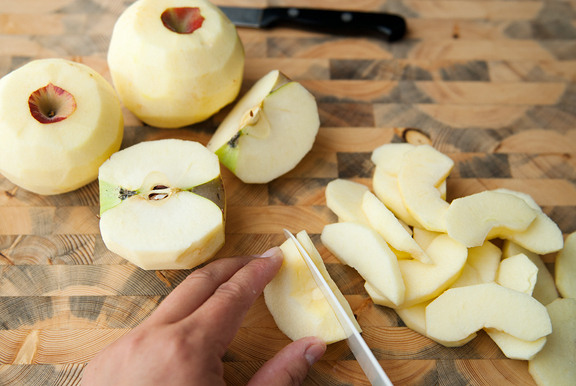 The recipe originally calls for three apples, but apples vary in size. I used four. 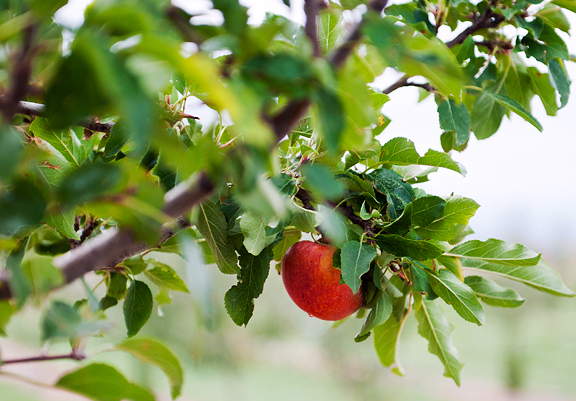 Leftover apples are never a bad thing. Also, I used my deepest pie dish because shallow fruit pies… what’s the point?! Next, mix up the custard. I hadn’t made this recipe in nearly a decade and I have to say that I think it could use some booze. Maybe some bourbon? I bet bourbon would be great in that. I’ll keep it in mind next time. Pour the custard over the apples. There wasn’t enough custard to fill my pie dish, but the apples will shrink in the oven and it actually works out perfectly. While the pie is in the oven, mix the streusel together. 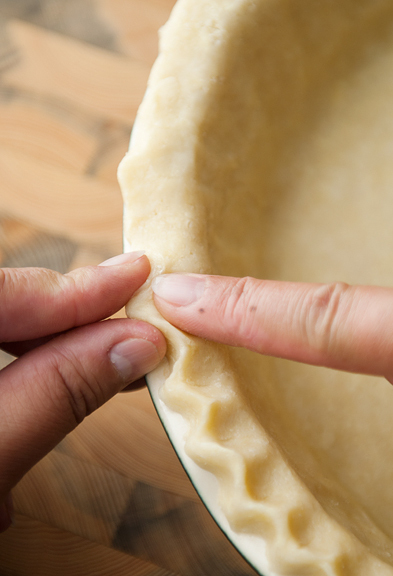 Check on the pie occasionally, to make sure nothing is bubbling over. I hate when that happens. The streusel is made with flour, butter, and sugar. I believe substituting light or dark brown sugar for the regular sugar (I use evaporated organic cane sugar, so it’s not completely white) would give a deeper flavor to the streusel. Another thing to change up next time. After 30 minutes in the oven, remove the pie. You’ll see what I mean about the apple shrinkage. 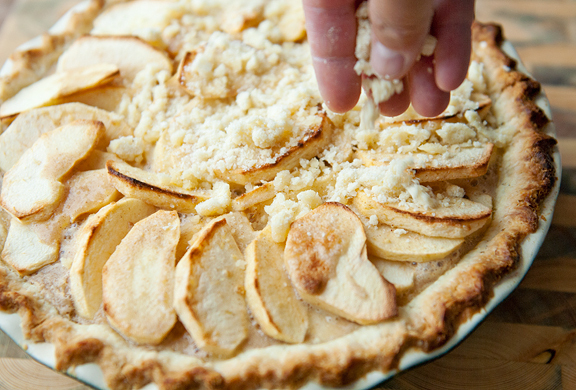 Sprinkle the streusel evenly over the pie and send it right back into the oven. When the pie is ready, take it out of the oven and let it cool for an hour. Even after an hour, it’s an oozy mess to cut and serve, but it’s a wholly satisfying oozy mess. There is a lot of fruit to counterbalance the custard. The streusel adds a nice crunchy, buttery layer in place of a second pie crust. It’s all good. 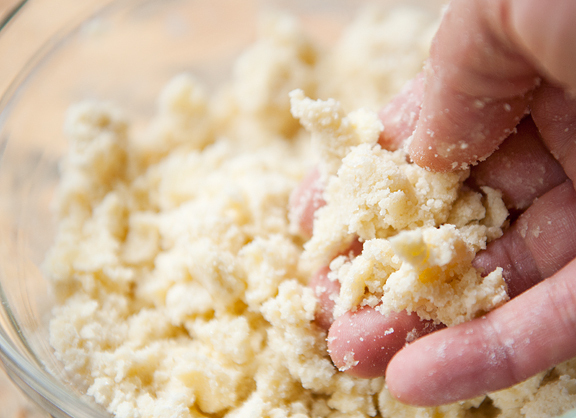 Make the crust: Freeze the butter for 15 minutes. 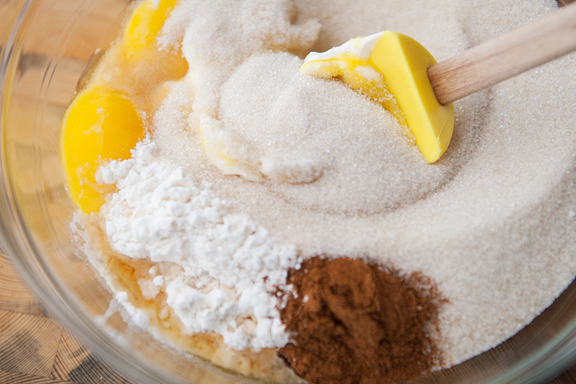 Place the flour, salt, and sugar in a food processor and pulse together. Add the butter and pulse until it resembles coarse meal with pea-sized bits of butter. Drizzle the water a tablespoon at a time, pulsing after each addition until it all starts to clump together. 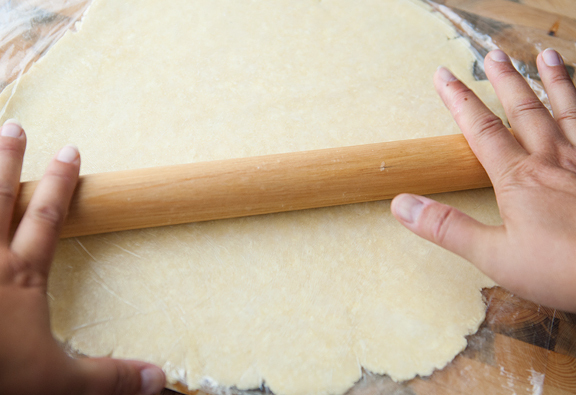 Empty the dough onto a clean surface and gently press together to form a disk. 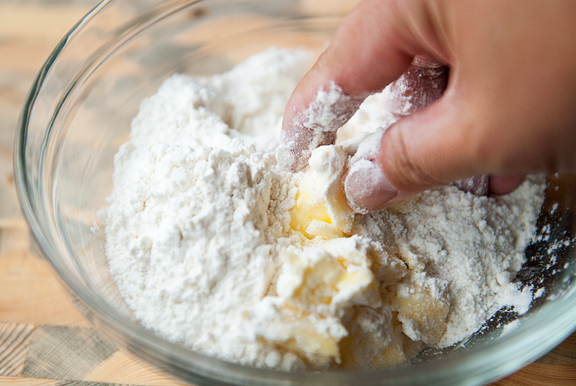 Try not to knead or work the dough too much, it will result in a tough crust. Wrap the dough in plastic wrap and refrigerate for at least an hour. Remove from refrigerator and let sit at room temperature for 5-10 minutes. I like to place the dough on a large piece of plastic wrap on my work surface, then place another piece of plastic wrap on top and roll the dough out between the plastic. It makes it easier to handle the pastry when I want to transfer it to the pie dish. Roll it out to about a 12-inch circle and 1/8-inch thickness. Remove the top sheet of plastic and invert onto the pie dish. 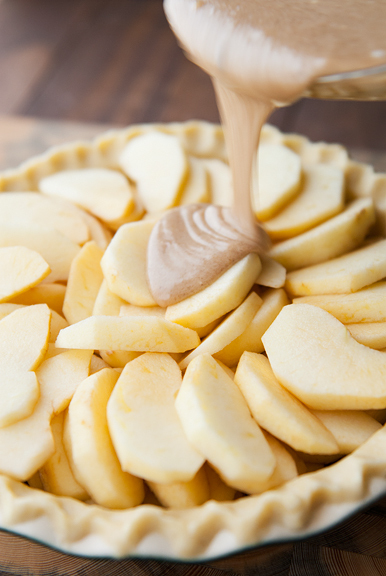 Make the filling and fill the pie: Preheat the oven to 425°F. 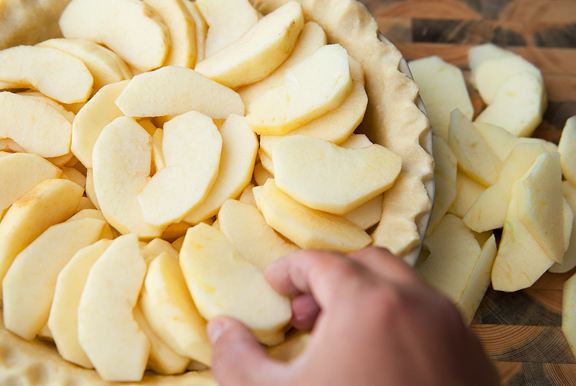 Line the pie crust with apple slices. In a medium bowl, mix the sour cream, egg yolks, cup of sugar, 1/4 cup of flour, vanilla, and cinnamon together until blended. Pour the custard over the apples (it might look like it’s not enough custard – it’s okay). Bake the pie for 30 minutes. Make streusel topping and finish the pie: Combine the butter, 1/2 cup flour, and 1/4 cup sugar (I think brown sugar would result in a better streusel) together in a bowl with your fingers until the mixture resembles coarse crumbs. Take the pie out of the oven after it has baked for 30 minutes. Sprinkle the streusel topping over the pie. Bake the pie in the oven for another 15 minutes. Remove from oven and cool for 1 hour. Serves 6-8. I don’t have a deep pie dish. Let me think up an alternative while I bookmark this!! I love streusel tops! 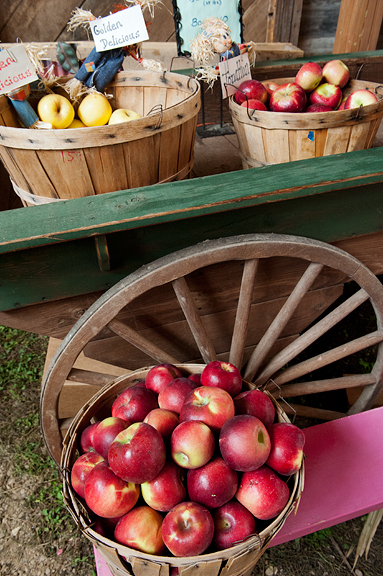 Just came back yesterday with a ton of apples from our trip to the mountains. Great recipe that I will try. Thanks! I am a sucker for streusel…and our crabapple which is more apple than crab (failed graft=2 colors of blossoms and fruit!) produced oodles of apples this year. Okay, now that I read this post, it is officially fall. We’re having guests for dinner Saturday. We have bourbon. And now we have dessert. Thank you. Yum! 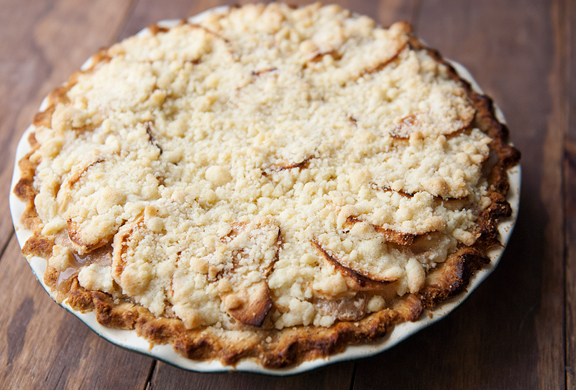 My friend’s in-laws from Switzerland make a pie similar to this, an apple custard pie, and when I asked for the recipe, they didn’t have one! They just know the custard filling without having to measure. But for my first time making it, I will use your instructions! Thanks! Hi Jen, I was wondering how much bourbon you would suggest adding. I don’t see any other liquid to substitute it for and am worried it might get too liquidy. Thank you. Uhmazing! We are heading to YaYa Farms this weekend so I will be making this recipe with my loot! This looks crazy good! This is absolutely lovely sounding! I especially like the custard. Aww to puppy pie! Silly me, I thought you’d made a ‘custard apple’ pie, as opposed to a custard ‘apple pie’. Probably because I’ve never considered custard in my apple pie. Again, silly me, because this looks great! Would love to see a picture of Kaweah in her puppy pie! Beautiful pictures, especially the lake image. We have a local pie company that tops all their pies with steusel. Great post. Beautiful apple pie! Makes me want to go to the kitchen and make it right now! This recipe was designed for me! I know a similar recipes that is in Creme de Colorado page 291. They call it Sour Cream Apple Pie. In the streusel it calls for walnuts. So yummy. 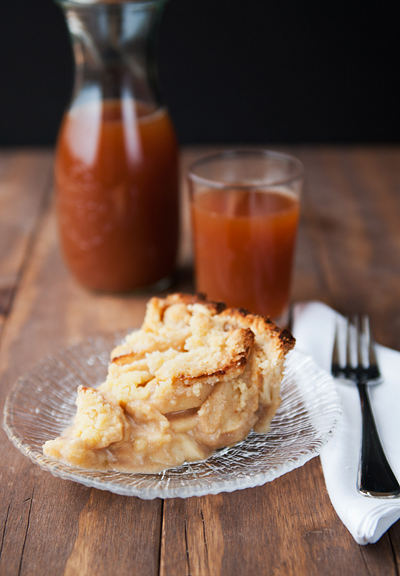 I make this pie at least 6 times a year and now it will be made with bourbon! A fantastic idea. In the same cookbook on the same page as the apple pie there is a recipe for Pumpkin Fluff Pie… another treasure especially this time of year. Just beautiful! so glad I stumbled across your blog this morning! . . and your assistant is the cuter thing ever! Love it! Such an attentive assistant! Ha! looks like a lovely pie. Wow. I need this pie in my life. Your beautiful dog has the same look in his eye that my rabbits get when I’m preparing fruit – it’s like they’ve never been fed! 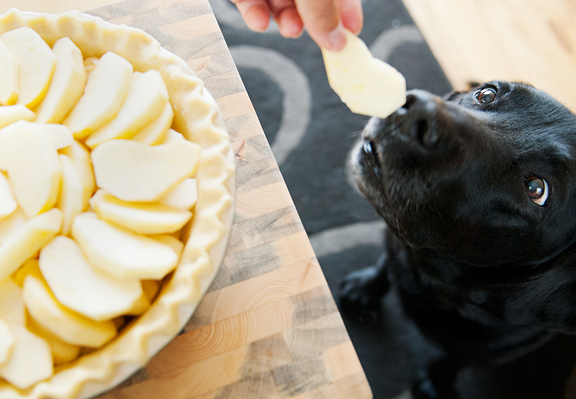 My Black Lab, Hank, is partial to pears, gobbles em faster than the cook! !, but will put up with apple slices too.. I used to have a recipe similar to this using Rhubarb..I’ve lost that recipe, so I’m gonna try yours. with apples and pears combined. Was busy this morning making sunchoke pickles with lemon and ginger..It’s gonna be a “kitchen day” for me! Forgot to mention..my great-granny always put TBLS of vinegar in pie crust..It’s a No-fail secret for sure!! Beautiful blog! I love it. I am a lazy bum too. I make a Swedish apple pie with only one crust. Beautiful website, great pictures and this recipe was fabulous! I made it last night for friends and every bite was gobbled up. I added 1 tbsp of dark rum to the custard, 4 additional tbsp of butter to the flour for the crust (it wasn’t coming together with a single stick), and instead of 4 tbsp water I used 2 tbsp vodka & 2 tbsp water (Cooks Illustrated technique). Laurie – I think there are quite a few variations out there. Hope you like this one! Liz – I’m bummed to have missed them. Sounded like fun. Y – ha ha! They both sound good, don’t they? Mmmmm. Natalie – that combo sounds fantastic. Bebe – maybe someday :) More likely to happen in winter! Jessica – I think I’m starting to fall in love with bourbon. Richard – ha ha! Yay for lazy bums! Natalynne – so happy to hear it! 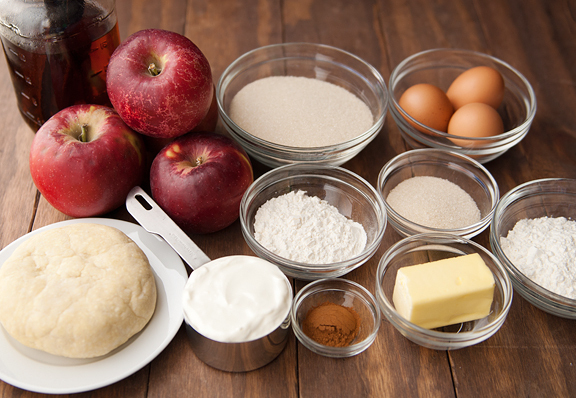 I had been looking for a good pie crust a good apple pie filling… and I found them both here! I made this for friends the other week and it was gone in a night! Thanks! I made this for my husband’s birthday and he said that this was the best pie he had ever eaten. I recently made this custard apple pie, and I loved it. You suggested adding bourbon to the recipe, and I’m wondering if you tried this variation yet? How much bourbon do you recommend adding to the custard? Melissa – I haven’t tried it, but I would guess 2 tablespoons?